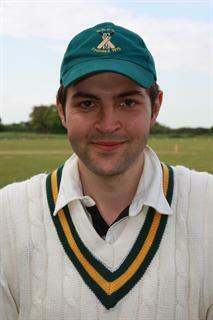 A hard-hitting opening batsman who loves to get involved in the fielding as well. Ed Sheen mis-times this drive with the Bocking fielders waiting for a mistake. Slip applaudes as Sheen contemplates his efforts. A Slower ball from the bowler has Sheen reaching for it. Ed waits for another Don delivery. Sayed and Aru celebrate taking the first Bocking wicket. Ed Sheen, who had taken over the gloves to allow Niall Fitzgerald a bowl, watches this one go down leg.